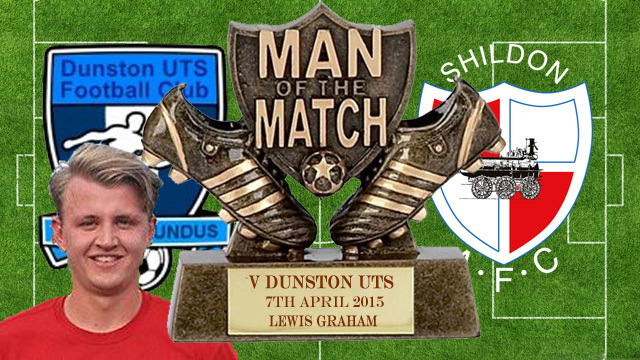 Shildon AFC reached their second cup final of the season with a hard fought 1 – 0 away victory to Dunston UTS on Tuesday 7th April 2015 in the semi-final of the Brooks Mileson Northern League Cup. The Railwaymen had the edge of a non eventful first half, before they broke through just 3 minutes into the second half when a left foot shot from outside the box from Mark Doninger hit the post and rebounded off the keeper into the net. After Shildon’s keeper Lewis Graham saved from captain Dave Coulson and Carl Jones blocked brilliantly from Lee McAndrews, Shildon nearly made it 2 – 0 with a Billy Greulich-Smith header going just wide. Dunston pressed forward for the equaliser but Shildon held on with Lewis Graham punching over a shot from Dale Burrell in the last minute. After the match manager Gary Forrest said “The character and the attitude of the players tonight was first class. Considering how many players were missing through injury, this was a great result. Our only subs were Adam Rundle, Jack Taylor, Danny Richmond, who hasn’t kick a ball for months and Keith Finch. The team did us proud”.